The x axis here is relative, not absolute. So -100 means a person’s median points in North America last season were 100% better than their median points in Europe. I’ve omitted the y axis labels entirely, since the idea here is to simply look at the shape of the curve, and where most of the area is located. The men’s sprint panel sticks out like a sore thumb for being so damn perfect looking. 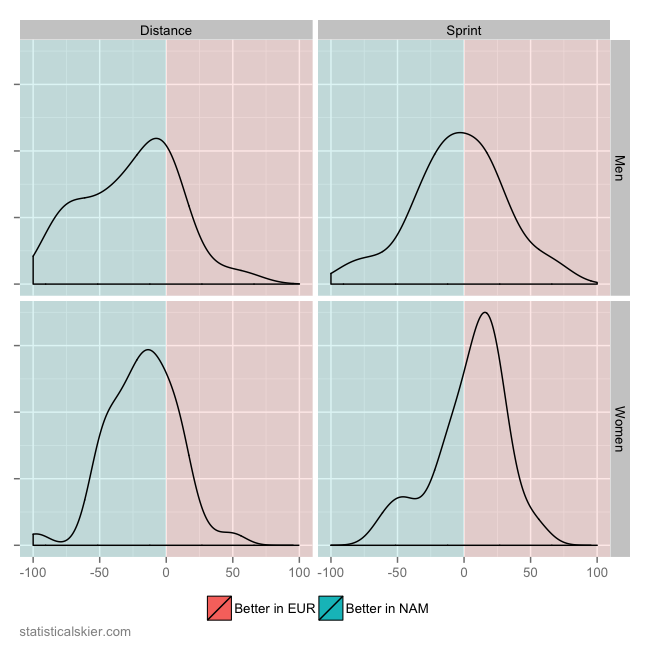 This strongly suggests that as a group, North American male sprinters weren’t really any more likely to score better FIS points in Europe or “at home”. As the distribution makes clear, though, there is plenty of variation between individuals and how their particular races went at home and abroad. While we’re on sprinting, my next biggest surprise was the women, who appear to have had a moderate trend towards scoring better sprint points in Europe. Before you start saying that Kikkan Randall is driving this, keep in mind that Kikkan only contributed a single value to that density estimate. Each individual skier only counts once in each graph. So maybe between Kikkan, Jessie Diggins, Ida Sargeant, etc., one might have expected some good points in Europe, but I wasn’t quite expecting it too be that clear. The distance panels aren’t too surprising, I think. Even with the recent improvements for the US women in distance events, US and Canadian skiers are still much more likely score lower points in North America than in Europe. Posted by Joran on Wednesday, October 2, 2013, at 7:43 pm. Filed under Analysis. Tagged Analysis, canada, fis points, men, USA, women. Follow any responses to this post with its comments RSS feed. You can post a comment or trackback from your blog.